Paying for any type of expensive prevention – whether it’s insurance or backup software – can sometimes feel hard to justify because you have to think about the odds that something will happen to you and what it will cost. The same is true with preventing software disasters and investing in improving your system to increase uptime. You can plug in your numbers to figure out how much you can grow your profits through investment in uptime improvements. Just change out any cells you see in pink and the numbers should update for you. The tool is seeded with some example numbers as placeholders so you can easily see how it works. Peak Customers / Day – put in the average number of customers that visit your site on your best days. Peak Days / Month – how many days per month do you have the peak number of customers? Avg Customers / Day – for your non peak days, how many customers do you have on average? Sales Conversion % – What percentage of customers purchase something when they visit? Avg Purchase / Customer – How much do people spend on average when they buy? Avg Fulfillment Margin – What is your average profit margin on each sale? Current Uptime – What is your current uptime percentage for your site? This will show the current revenue and profit loss based on the sales assumptions. Goal Uptime – What uptime do you expect to achieve if your improvement project is successful? You can now see what profits you’re missing from not being at this level of uptime. 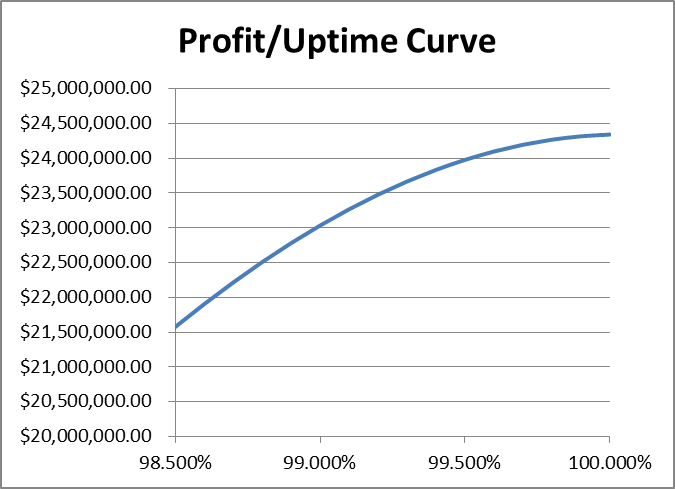 Cost to achieve uptime goal – How much will it cost in order to see the expected improvement? This should include labor costs, capital costs, hardware, software, testing and anything else required to make the new uptime percentage a reality. After you’ve plugged in all your numbers, you will be able to see if this project is a good idea financially, and how it play out over 1 month, 1 year, and 3 years. Now you can make a more educated decision. Also, you can see the Uptime/Profit curve for your current sales assumptions so you can visualize the effects of downtime on your profits. Achieving higher uptime means better service for your customers and better profits for your company. However, raising the bar on uptime comes at a cost and it’s important to evaluate the investment up front. I hope you found this tool informative and useful, and I’d appreciate any feedback! Do you have ideas for how to improve it? What other factors are important in making an IT investment to improve reliability? * Disclaimer on the Uptime ROI Calculation Tool – This is provided as is with no warranty expressed or implied. Use at your own risk, I assume no responsiblity for its use. It is intended for demonstrative purposes only. Take that lawyers. Product Manager @ Google - working on Kubernetes / Google Container Engine. This entry was posted in Business Continuity, Cloud, Disaster Recovery, Downtime, Technology, Uptime and tagged Availability, Calculator, How To, Internet Security, Investment, IT, ROI, Web Service. Bookmark the permalink.